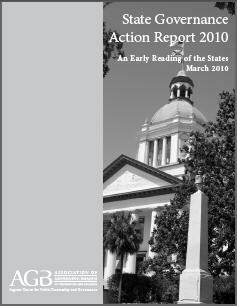 This March 2010 report includes a detailed summary of the most relevant issues, legislative proposals, and proposed policies facing the governance and oversight of public higher education. Declining fiscal conditions continue be the major higher education issue in the states. Funding for higher education was essentially flat from FY 2008 to 2009, with state and local appropriation declines offset by federal stimulus dollars. Indications for the current fiscal year are worse. Federal stimulus dollars will end in FY 2011. Even with a reviving national economy, state fiscal diffculties are predicted to persist for the next 10 years and have both higher education and state government leaders concerned. Despite or because of the fiscal crisis, higher education has become a major priority on state elected leaders’ agendas. The National Governors Association (NGA) will make postsecondary education its primary initiative for one year beginning in July 2010. The National Conference of State Legislatures (NCSL) reports that higher education ranks third in its annual survey of all state legislative leaders on the top issues for the upcoming legislative sessions, immediately behind the budget and transportation. The fiscal crisis has prompted several states to institute special planning processes or commissions to review higher education. Forward-thinking state higher-education agencies and university systems have developed workable strategic plans and public agendas that focus foremost on the future of the state, including its education and workforce needs. Several states, institutions, and university systems are responding to the budgetary crisis by advancing proposals to do things differently in the future, particularly when it comes to deregulation initiatives. Tensions between deregulation and autonomy on the one hand, and centralization and cost control on the other, are playing out in several states. The budget condition for public higher education has prompted efforts to grant more freedoms to public colleges and universities. Foremost are proposals to grant greater fexibility for setting tuition. Some states are considering granting full tuition autonomy to their public institutions, that is, removing all constraints or oversight by the legislature or state higher education policy board. Supporters of access and affordability may temper some of these efforts, although the persistence of state budget problems may increase the chances of passage for others. Separate from, or in combination with, granting greater fexibility on tuition, several states are considering legislation to grant greater freedom and flexibility to colleges and universities regarding operational controls. Dramatic efforts have been proposed in New York, New Jersey, Nevada, and Oregon, and in other states as well. Proposals to restructure or reorganize higher education governance are a direct consequence of fiscal problems in several states. A few states propose achieving savings through consolidation of boards, systems, and institutions. The outcome of several legislative proposals and developments will depend not only on fiscal and budget conditions, but on the support of the states’ governors. In the fall, a total of 37 gubernatorial seats are up for grabs, and a minimum of 23 states will have new governors in January 2011.